The online credit score and financial resource WalletHub recently named Las Vegas to the top spot in its 2017 list of the best places to get married. WalletHub’s data team compared 150 of the most populated U.S. cities to find the most affordable and convenient destinations, which also promise a memorable occasion. The team examined each city across 20 key indicators of nuptial-friendliness, including average wedding cost, venues and event spaces per capita, and hotel availability. 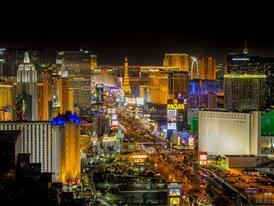 Las Vegas also enjoyed a three-way first place tie with New York and Chicago for cities with the most attractions. Read the full report here. For more information, contact Maria Phelan, LVCVA, mphelan@lvcva.com. Widely known for its popularity throughout Asia, the new Trick Eye Experience at Monte Carlo Resort and Casino encourages passersby to become part of the art with life-size interactive 3-D paintings. The Trick Eye Experience was created by Melanie Stimmell and her team of artists at LA-based street art company, We Talk Chalk. The concept is designed to entice guests to explore the work, insert themselves into the scenario and pose for photos, bringing the vibrant paintings to life. The Trick Eye Experience at Monte Carlo will be on display until 2018. Additional murals will be added throughout 2017. For more information, contact Brittany Harris, MGM Resorts International, bharris@mgmresorts.com. Delano Las Vegas has partnered with the Las Vegas Fashion Council to showcase a dynamic mannequin exhibit created by local artists now through May 2017. Featuring ten individually designed mannequins, known as Madisons, the exhibit is inspired by the idea that each being has their own personal journey and path to follow. Each figure has been created with its own identity and guests are encouraged to spend time with each Madison to reflect and interpret their own stories. For more information, contact Emily Olson, eolson@mgmresorts.com. Beginning March 3, Brightside – Breakfast and Burgers will offer guests at the Plaza Hotel & Casino a delicious dining experience reminiscent of an authentic New York-style deli with traditional breakfast items, specialty and made-to-order sandwiches, burgers and salads served all day long. A quick casual restaurant located on the casino floor, Brightside will also offer various grab and go options. For more information, contact Amy E. S. Maier, Faiss Foley Warren, amy@ffwpr.com. The award-winning Serenity Spa by Westgate is now open at the Westgate Las Vegas Resort & Casino. The number-one rated spa in Utah, Serenity Spa by Westgate brings the natural, rustic atmosphere of the Rocky Mountains to the Nevada desert, for the ultimate experience in relaxation and rejuvenation. Serenity Spa by Westgate offers a sophisticated menu of world-class massages, facials, body treatments, nail services and more. For more information, contact Jeff Klein, PR Plus, jeff@prpluslv.com. Pawn Plaza is welcoming two new venues: Jared’s Old Fashioned Hotdogs & Hamburgers and Elite Motor Rentals. Now open, Jared’s Old Fashioned Hot Dogs & Hamburgers features a variety of classic hot dogs and hamburgers made with the freshest USDA Prime beef with a choice of toppings, onion rings, French fries and tater tots. Elite Motor Rentals, expected to open this spring, will offer Polaris Slingshot rentals for a variety of open road adventures including Red Rock Canyon, Mt. Charleston, Hoover Dam and more. The Polaris Slingshot is an exotic three-wheel hybrid of a car and a motorcycle. For more information, contact Hillary Smoot, PR Plus, hillary@prpluslv.com. Las Vegas-based Allegiant Airlines expanded its partnership with Make-A-Wish® by donating office space to the Southern Nevada chapter, making Allegiant's Las Vegas offices the new home of the nonprofit organization's administrative headquarters. Make-A-Wish® Southern Nevada now occupies 7,500 square feet of space at a cost of $1 per year for five years. The site, located on Allegiant's campus, will also serve as the host location for volunteer training, meetings and a place of support for families of children receiving wishes. For more information, contact Allegiant Air, mediarelations@allegiantair.com.